Drew’s Station, wrote an account of those times. It would be a challenge for any of us, late in life, to recall with accuracy, the days of our youth. And the first publication to conclusively prove the exact location of Drew's Station was "On the Road to Tombstone: Drew's Station, Contention City, and Fairbank," by John D. Rose. But such accounts offer at least a glimpse of a time and place that otherwise we would know very little about. Cora Drew Reynolds wrote of her families moving to Arizona, and the little adobe building which would become a memorable part of the Tombstone and Earp story, known as Drew’s Station. “From Signal [Arizona Territory] we moved to a spot on the San Pedro River about eighty miles north of Tucson [Drew’s Station is 61 southeast of Tucson on the roads of the day] which was our closest trading post. Father and my oldest brother, Harrison-who was around eighteen-with the help of two Mexicans, built a three-room adobe house. [Cora’s older brother who helped build the family home/ stage station was George Harrison Drew. Harrison, as she called him was living in Contention City working as a teamster in 1882.] It had dirt floors and doors made of logs with thick canvass covering the window openings. That year we had a nice garden and a good crop of corn. “During this period the Contention Mine [Mill] was opened up about ten miles north [the Grand Central Mill was the first to open, so this is likely the mill she’s referring to-the distance from her home to the Grand Central Mill was 3.6 miles to the south south east] of what was to become the town of Tombstone. A smelter was built and material was brought in by mule teams. Before the smelter was completed my father passed away in November of 1880. I was then eight years old. Soon afterwards, my brother Ed was able to secure the contract to deliver wood for the smelter. He hired Mexicans to cut the wood from the Chiricahua Mountains. Cora also recalled a visitor at their ranch though the timing of this visit based on her account leaves this information in question. “That spring a man came to our ranch on foot. He begged his supper and breakfast and we bedded him down for the night in our stables. That man was Ed Schieff[e]lin, and he went from our house and discovered the fabulous Tombstone lode around which grew the fabled mining town. We saw him many times afterwards both at our ranch and in Tombstone but in time he forgot those who had been a friend to him.” Schieffelin’s discoveries clearly took place long before any mills were built to refine the very ore that he discovered. Of the shooting death of Philpot she added: “Once the stage was robbed but a short distance from us. The nine o’clock left our place, with Bud Philpot driving, loaded with silver bullion from Tombstone. [actually the stage was approaching Drew’s when this occurred, not leaving from it, so the Drew children didn’t say good night to Bud on that evening, though it’s likely they had met him prior to that evening] Hardly had we said goodnight to Bud when we heard a shot ring out, and then the shooting sounded as if a bunch of firecrackers were going off. The bright Arizona moonlight made it possible for Mama and us children to see the whole thing and we saw the holdup men ride around the hill and off into the distance.” Given the distance from Drew’s Station/home to the location where Philpot was shot, (see map on our Drew’s Station page #1) it is unlikely that they would have seen the entire event given the distance, no matter how bright the moon that evening may have been. But they did see a portion of the event just afterward, as the Epitaph noted. “At Drew’s Station the firing and rapid whirling by [sic] of the coach sent the men of the station to the scene of the tragedy, when they found poor ‘Budd’ dead lying in the road, and by the bright moonlight saw the murderers fleeing rapidly from the place.” Interestingly, the Epitaph notes that the telegraph from Benson telling of the event didn’t reach Marshall Williams in Tombstone until 11 o’clock that evening, and Cora refers to the Stage in the area of Drew’s at 9pm, and the stage had passed through Contention at 8pm. Ayles( see our Drew’s station page #1 to read his entire letter on this matter) prediction of dire results for the surviving passengers was likely but remedied by the bold actions of Bob Paul that evening, whom Ayles referred to as “Bob Paul, Wells, Fargo’s old reliable…” See below for further explanation of the topography of the stage route that Bob Paul and Bud Philpott drove on that evening..
Cora also stated that she was a witness to what is now known as the gunfight near the O.K. Corral. “...my brother Ed and I were walking down the main street of Tombstone when we saw Tom and Frank McLowery with Ike Clanton’s brother Billy coming toward us. Suddenly from a side street came the Earp boys and they opened fire killing the three men instantly.” Though the description of Cora and Ed being in the “mainstreet” and the Earp’s shooting suddenly from a side street is in conflict with the known body of information about this fight, that she would make this claim coming from a local ranching family is not at all surprising as many others have made similar claims, with little to corroborate. THE STAGE ROAD TOPOGRAPHY AND INSIGHTS AS TO HOW THIS WAS VIEWED IN THE AREA CIRCA 1881. Living at the time in Contention City, Ayles notes, “This occurred at what is known as the ‘wash,’ just below Drew’s Station…” he wrote. Ayles learned the following from Ed Drew, one of Cora’s brothers. This is a clue to understanding how they viewed their terrain, because it was often based on the local perspective of the person writing it, and where they were writing from. The Kinnear stage’s journey was from Tombstone to Benson. The stage left Tombstone, went to Contention, and then headed toward Drew’s station on the way to its Benson destination. So when Ayles, writing his account from Contention, says the attack occurred at the wash “below” Drew’s, the meaning in our terms today is “before” the stage had reached Drew’s, not after. When traveling north from Contention to Drew’s, the wash that is traversed “before” Drew’s is clearly to the south of Drew’s, and not to the north, as Cora recalled a lifetime later. We in the U.S. don’t say that we headed “up” or “north” to Mexico, nor do we say that Mexico is a “above” our location on the map. For those who live in South America, for example, saying that Mexico is “above” their location and that they are headed “up to” or North to Mexico makes sense. The Epitaph describes as follows: Note the similarities. “As the stage was going up a small incline about two hundred yards this side [meaning that Tombstone is in a southern direction from Drew’s station] and about a mile the other side of Contention City…” From the Tombstone perspective, “one mile the other side of Contention City” is to the north when leaving from Contention City. The Epitaph’s mileage estimate is close, as it is a mile and a quarter from Contention City to the wash where the Philpott shooting took place. The Epitaph estimate of “two hundred yards” (which equals 600 feet) from the wash to Drew’s Station is in reality underestimated by 1000 feet. These accounts both pinpoint the area, and both point to the fact that the stage attack occurred in a wash that was about one mile north from Contention City and about two hundred yards south of Drew’s. This confirms the image of the adobe wall that we have on our Drew’s Station page #1, and we are by no means the first to publish a photo of that wall. This ill-fated journey from Tombstone to Benson by Stage, with Bud Philpott at the reins, never successfully made it as far as Benson, or even as far as Drew’s Station. The wash prior (south) of Drew’s was the last location Bud Philpott would ever see in his lifetime. The rest of the journey to Benson, without Philpott, had Bob Paul, as driver, fleeing from the scene of the tragedy, hoping to save the life of passenger, Peter Roerig, who died in Benson that evening. See the related map below. This map study shows the distances of key locations as Bud Philpott drove his Kinnear Stage Coach into a planned attack by highwaymen. Note that the distance from Contention to the wash where he was killed is 1.25 miles, and the distance from the wash to Drew's Station is 1600 feet. As many in the Earp field know, I have had an open door policy inviting so many to my home to view my collection. I've always wanted to share history, and seeing the excitement of another historian or collector react to items that I have shown them , takes me back to when I first saw it, and this has long been a source of joy for me. But the collection has reached a level of value that I never anticipated, and so I have moved the more valuable portions of the collection out of my home, into secure vaults at financial institutions. With this in mind, I have decided to publish on our site a small portion of one of my favorite documents, and I may do more of this down the road should our readership enjoy this. The contents of the ledger have never been published in any forum that I am aware of, nor have I seen its contents in any Tombstone related writings. From the ledger, here is a brief excerpt showing that A.C. (Arthur C.) Cowan was attending meetings of this group in Tombstone during the Earp era. It was A.C. Cowan, the Wells Fargo agent at Contention, who rode to Tombstone on the evening of March 15th, 1881 to notify authorities of the shooting of Bud Philpott. The "Edw Drew" is actually Edwin Drew, who hailed from England. He was a miner in Tombstone during the same period of time, thirty six years old in 1882, and not one of Drew's Station family. Note, also, that Wells Spicer appears on the same page, who's "Spicer Hearing" was a key event in the Earp saga. He is among so many of Tombstone's luminaries of the day who appear in these numerous original pages, both for their status in the community, and for their important roles played in Tombstone's most celebrated drama. Other pages of the ledger also include one of the participants in the gunfight near the O.K. Corral. I hope my worldwide readership enjoys viewing such scarce and rare documents as do I. The Drew family would later move from their Stage Station and purchase the Smith ranch. D.T. Smith was a victim of the Bisbee Massacre, and so his widow is advertising to sell the ranch. See ad below courtesy of Troy Kelley, the authority on the Bisbee Massacre. The above information is in part excerpted from On the Road to Tombstone, by John D. Rose, published in 2012. 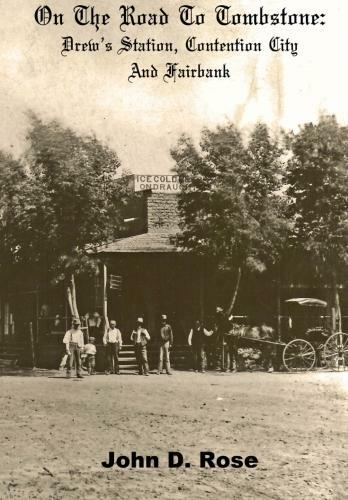 This is the first book devoted in great detail to Fairbank, Contention City, and legendary Drew’s Station, but also offering an in depth view of the importance of Tres Alamos as an early transportation hub in the wilds of the Arizona Territory. For more on this story and other research breakthroughs, this book is available at https://www.createspace.com/3952635 as well as Amazon.com.